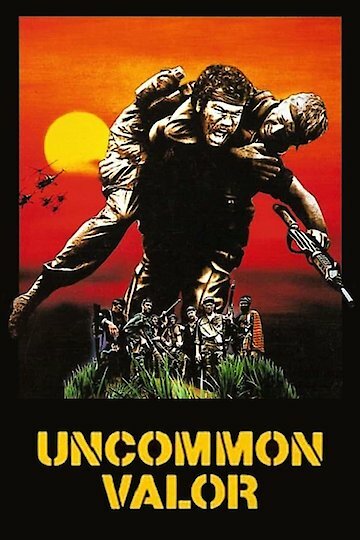 Uncommon Valor is an action adventure film set in post-conflict Vietnam. The story is about Marine Colonel Jason Rhodes. Colonel Rhodes is portrayed by screen legend Gene Hackman. His son was listed as missing in action while on a mission during the Vietnam War. Colonel Rhodes has been financing, with some help from another desperate father, missions to scout out a POW camp in Laos. With the reconnaissance turning up proof of the active camp, he turns to the government for assistance. He is rebuffed in his attempts, so Colonel Rhodes turns to a group of Vietnam veterans who served in the war with his son. His plan is to invade the camp and rescue the prisoners of war. One by one, he visits the group of grizzled ex-vets. Each of these men has a reason to stay at home and ignore the offer, but they have bigger reasons that lead them all to accept the assignment and return to the scene of their war days. The group of misfits includes Blaster, an explosions specialist. Another vet recruited is Wilkes, who was the tunnel rat of the unit and still has nightmares about his experience in the Vietnamese sewers. Colonel Rhodes also tracks down Sailor, who had a penchant for drug use but also was intensely loyal. Blaster spends his days locked up in a mental institution, but he is granted release to help with the mission. They also track down Charts and Johnson. They were two of the best helicopter pilots in the military. Despite objections from the group, Colonel Rhodes also hires Kevin Scott. Scott is a young soldier who was not old enough to serve in the war. As the group trains for their mission, Scott is hazed by the elder soldiers. When he is knocked down by Sailor and refuses to quit, he explains that his father is a missing-in-action soldier as well. The guys take him under their wing. The last half of the movie shows the group on their mission. They have a plan that can save a group of innocent prisoners, but they are risking the ultimate price themselves. Starring alongside Hackman are Robert Stack, Fred Ward, Patrick Swayze, Reb Brown, Randall "Tex" Cobb, Harold Sylvester and Tim Thomerson. Uncommon Valor is currently available to watch and stream, download, buy on demand at Starz, Amazon, Vudu, Google Play, iTunes, YouTube VOD online.